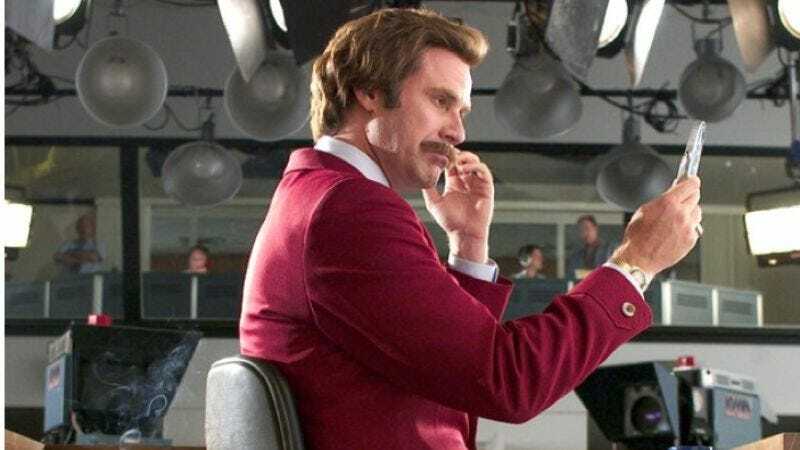 Because Anchorman 2 cannot be an assemblage of disjointed, Dadaist comic phrases—or rather, cannot just be that—Adam McKay and Co. continue working on an actual screenplay that will probably more or less be abandoned under a torrent of improvising. "We've done about two percent!" McKay tells Empire, quickly qualifying, "Half a percent? We've got five pages of story notes and chunks of story. We're holing up writing for the next three months." Nevertheless, buried in those chunks is the basic plot: McKay says the main conflict of the sequel will come from the late-'70s arrival of the 24-hour news cycle, and with it the "Latino anchors and African-American anchors" that create the old, old wooden ship used during the Civil War era to which the Action News team is so averse. McKay didn't offer any hints as to how his previously teased "custody battle" and "bowling for dollars" might factor into that storyline, but he did say that they "already have a couple of ideas" for how they will match the first film's epic, trident-aided newsman melee. So in other words, they've got their priorities in order.